Ah, the torment, the dissatisfaction, the disappointment. Folks, we had such high hopes of our meal at Minerva Indian restaurant on Frederick Road in Gaithersburg, MD. But to borrow from the title from an old Harold Robbins book - Dreams Die First. We walked into Minerva Gaithersburg the other day primarily because of pleasant memories from a visit to the Minerva outpost in Chantilly, VA sometime back. Alas, not all Minervas are the same. 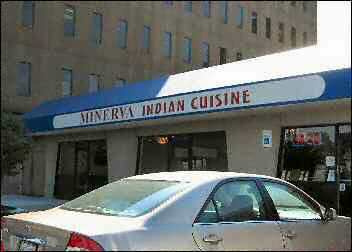 What a shame, the Gaithersburg outpost of Minerva turned out to be an impostor of Indian cuisine. Much of what we tasted at Minerva Gaithersburg was disappointing. The two Chutneys (Coconut and Tomato) were cold and flavorless while Dal was hopelessly bland. Uttappam was not thick as it ought to be. With just grated carrot pieces, the thin Uttappams did not yield us much pleasure. Idlis were soft but had light yellow patches on the edges and on one side. Naan bread was a travesty, as crisp as a Dosa. Vegetarians might be mortified to learn that when the tongs of the Naan bread on the buffet table fell into the Chicken Biryani vessel a Hispanic waiter picked it up, carelessly wiped it (some Chicken Biryani was still sticking to the tongs) and placed it back inside the Naan container. Chicken Biryani was not in the least flavorful and not a bit spicy while Tandoori Chicken was no better or no worse than at most Indian restaurants in the U.S. Goat Roganjosh was too sour. No kidding. But at least it had some taste. Butter Chicken set in a reddish-orange thick creamy sauce was alright but nothing to write home about. Kadai Paneer, with orange and Paneer pieces set in an orange-brown medium-thick sauce, was one of the few flavorful curries at the buffet table. Set in a watery gravy, Chepala Pulasu (a popular dish from the South Indian state of Andhra Pradesh) was not one bit spicy and we doubted any chillies or chili powder had even gone into its preparation. Mercifully, the two desserts Mango Semiya and Kaja were treats to the palate. Throwing all caution to the winds, we heaped a second cup of the divine Mango Semiya. The small, fried Kaja sweets were equally tempting. Overall, the desserts excepted we were disappointed with our meal. Minerva Gaithersburg seems to be making a deliberate attempt to dumb down on the use of spices in hopes of attracting a large American clientele whose effete palates may rebel at genuine spicy Indian food. And that's a shame because it's the spices that add the zing to Indian food. Apart from our dissatisfaction with the food, we were distressed to see several dirty dining plates that were not washed properly and containing leftovers of previous meals sticking to them, and chipped cups.